Since Dr. Roentgen discovered X-rays, the same method of X-ray photography has been used in the medical field for more than 100 years. Meanwhile, it has achieved higher sensitivity using less X-ray radiation and greater sharpness to provide clearer images. X-rays have used film for a long time, but a digital system debuted with superior images and less radiation. Exposure from the patient's standpoint is the same as before, but the digital system brought a major evolution, eliminating the need for development after the exposure and allowing the creation of pictures in a dry environment or diagnosis using a display. Thanks in part to image processing, digitization of X-rays brought considerably clearer images and reduced exposure to X-ray radiation. Today many medical organizations use digitization, but mammography requiring especially high-resolution images, analog exposure is still used. Absorption contrast occurs when X-rays penetrate objects and generate X-ray images (Fig. 3). An X-ray is an electromagnetic wave much like visible light, and when penetrating an object its phase changes. This phase change is generally observed as refraction or interference. 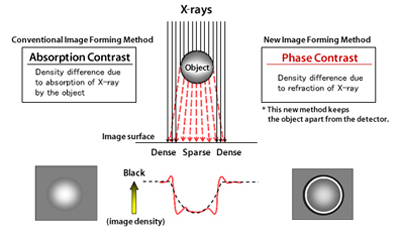 X-ray strength differences or image contrast based on this phase change is called phase contrast, and a combination of absorption contrast and phase contrast is the key to high-quality pictures. Phase contrast technology in X-ray exposure is completely different from conventional approaches and revolutionary in that the edge enhancement effect makes the X-ray images immediately after penetrating the human body (photographic subject) sharper to enhance the image quality of the recording. You can see that this phase contrast image has greater sharpness than conventional X-rays (Fig. 4). 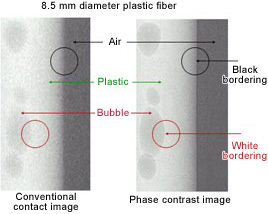 A black line is seen at the boundary between the plastic and air and the margin of the bubble in the tube is white and clear (sharp). For phase contrast results from X-ray interference, it was thought that geometric obscurity in X-ray tubes used for medical care removes phase contrast because of enlargement exposure that takes pictures by moving the X-ray detector away from the photographic subject. Konica Minolta has discovered that X-rays do not interfere, based on geometric optics theory analysis. Phase contrast can be obtained at 0.1 mm small focal spot of the Mo anode X-ray tube for mammography if the distance between the focal spot and the photographic subject is more than 0.5 m, and the distance between the photographic subject and the X-ray detector is more than 0.25 m. Konica Minolta has studied methods to apply this to achieve drastically higher quality images. Mammography is an especially focused variety of X-ray exposures because the disease (a cancer) depicted in the image is very small, and the shape is important. A physician searches not only for the shade of a white lump at the top of the picture (Fig. 6) but also for small white spots (minute calcifications) of several hundred microns and pays attention to the shape. These minute calcifications are especially important and considered the start of breast cancer (initial breast cancer). Konica Minolta wanted to promote digitization of mammography and contribute to eradication of increasing breast cancer with unprecedented high-quality images by applying phase contrast technology capable of substantially enhancing image sharpness. 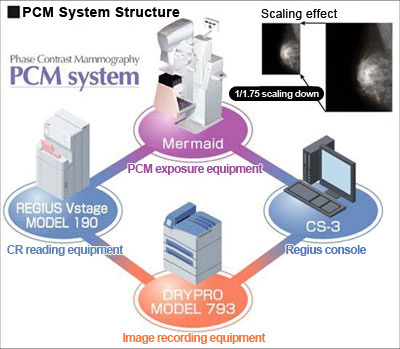 Konica Minolta has developed a digital mammography system utilizing phase contrast technology and released it as the PCM system. The PCM system acquires ultra high-density image data of about 70 million pixels in an exposure using a half-cut cassette for PCM and 43.75 μm reading. In addition, we achieve the highest image quality with greater sharpness and graininess with a combination of full-scale film output and films with the maximum density of 4.0. Fig. 7 shows an example of clinical images (from Shiga University of Medical Science). 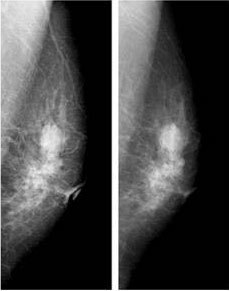 Comparison of the PCM image (left) with the conventional SF image (right) taken with the same photographic subject radiation dosage shows a more clearly depicted breast structure in the PCM image. After the study of several clinical images, the PCM system is proven superior to that of conventional SF images in its depiction of minute calcification images, which is the mission of mammography. 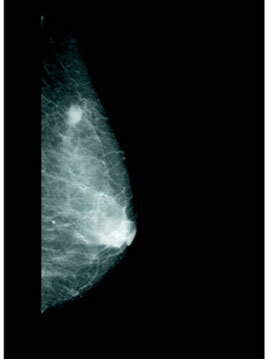 We sincerely expect that this system will contribute to the early detection of breast cancer.